Sugarcreek, OH, July 11, 2017 --(PR.com)-- One of the fastest growing recreational vehicle manufacturers in America will be hosting its inaugural üCamp17 rally July 24-29 at Winklepleck Grove Campground just outside of Sugarcreek, Ohio. The campground is located about a mile from the nüCamp RV factory in Tuscarawas County, offering attendees ready access to factory tours, service appointments, and opportunities to meet with the company’s research & development team to discuss future product ideas. nüCamp RV manufactures the T@B Teardrop Camper, T@G Teardrop Trailer, and Cirrus Truck Camper. 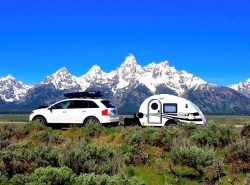 Prior to April of 2017 the company manufactured the Little Guy Teardrop Camper Trailer and distributed its products through Little Guy Worldwide of Green, Ohio. The companies parted ways upon the expiration of their distribution agreement, and nüCamp RV now distributes its products directly to 125 dealers in North America. In addition to offering attendees the opportunity to tour local sights, nüCamp RV will be offering service and modifications, “mods,” as they are known by enthusiasts—throughout the week. Attendees will also be treated to an Amish dinner, a wine and cheese reception, and an outdoor showing of the movie Grease. Attendees are expected from as far away as Washington State and Maine. RVing is becoming increasingly popular, and lightweight towable trailers, in particular, are growing in popularity. According to the Recreational Vehicle Industry Association (RVIA), shipments of travel trailers are up 22.9% for May of 2017 over the prior year, and total RV shipments are up 12.2% year-to-date over 2016.